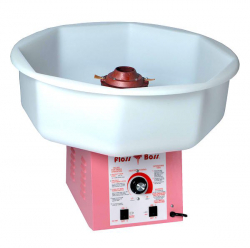 The Cotton Candy Machine makes tasty classic style cotton candy everyone is used to. This machine is very easy to use and comes with 50 servings of sticks and floss sugar. If you want additional servings they our $0.35 each per serving. Very simple to operate, instructions included. Does not come with table or stand. Client will need to supply: This unit requires one motor, which means we will need 1 electrical source within 50 feet of set up.